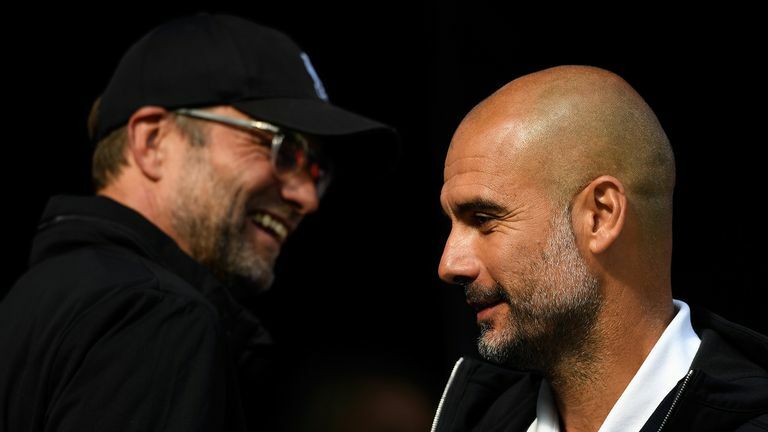 Liverpool boss Jurgen Klopp is giving little thought to the pressure of the title race and is instead intent on enjoying the journey his side will go on between now and May. 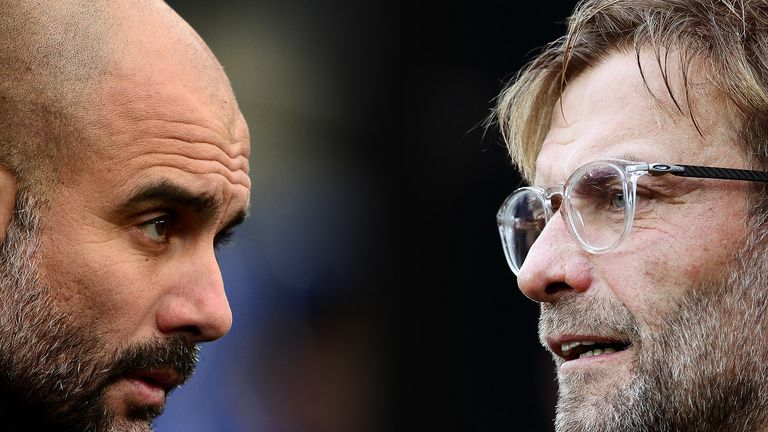 Klopp was speaking to Gary Neville ahead of the league-leaders' hotly-anticipated trip to defending champions Manchester City on Thursday night, live on Sky Sports. Liverpool go into the game knowing victory would be a huge step towards landing their first-ever Premier League crown - but Klopp isn't getting carried away. "Now, we are in a really good moment, that's true, but we have to go to Manchester City and play all the other big ones apart from Arsenal," he said. "For us, the target was to qualify for the Champions League and even that is not sure because the others can win 17 games in a row. "I don't need to know now what will be in May... I don't want to. I want to enjoy the ride until May!" "We have to only be focused on us and that's what we do and so far, the mood in the club and around has got better and better. We will see where that leads us to." Klopp twice won the Bundesliga with his former club Borussia Dortmund but says there is no formula for dealing with a title run-in. "If it happens, we will see how we deal with it," he said. "There is nothing we can prepare. It sounds like a luxury problem to be honest. "I didn't write it down when I was at Dortmund, saying 'we dealt with it like that' - we didn't deal with it like that. We will see. It's life and in life you always find a solution as long as you are healthy. "Our people have learnt a lot in the last couple of years. They trust the team again and all the things around are not important. "You need luck with players injury-wise and in the games, you need all that, the key moments, and we don't know if that will happen. "We don't think about it really - that's the truth. Who thinks in January about being champions? When I was with Dortmund, we were always in the tunnel because we had no time to think about anything else." That we are in this situation is a surprise. Everyone said 'yes, they are good' but nobody thought we would be seven points ahead before the game. It wasn't possible at the beginning of December when we were one point behind and because of the games we played and they played, it happened. It doesn't make them worse or us better, it is just the situation and now we have to play the game. The style is different in Germany. You don't have to break down teams as much as you do here. When Liverpool, Man City or Tottenham go to some teams, they really sit back and that doesn't happen a lot in Germany to be honest. They all have their own idea. As a manager in Germany, you have to have your own idea and you have to create it by yourself so that opens up games a bit more. But here, we have to break down teams pretty often. I'm here for three-and-a-half years, I don't know and I don't think we have to think about the size of it. At one point or another, some team will change the fortune. If that's going to be us, I don't know. All the other people say 'it slipped through their fingers, they were close there' and it's a funny thing for all the other supporters of other clubs. The supporters listen to that, but I don't, so for me, it isn't important what happened four, five or ten years ago because it's not my story. You need someone who was not involved in that. I am not nervous about it. If I fail, I fail but I don't fail because someone failed 20 years ago. So if we succeed, we succeed, because we did it right and not because someone did it 20 years ago. We will try everything we can but we cannot try more. "I am not nervous about it. If I fail, I fail but I don't fail because someone failed 20 years ago. So if we succeed, we succeed, because we did it right and not because someone did it 20 years ago." I really like Pep and I admire his work, he's outstanding. For me, the world's best manager and I don't say that now because he said we're the best team in Europe or the world or whatever. It's just a nice thing. He said it because until then, we had conceded seven goals I think and didn't concede in nine in a row or something like that so he only said the numbers. When you are beating the likes of Man Utd and Tottenham, then you are one of the best teams in the world. For me, Man City is the best, but it's not important. We want to win against them, there's no doubt about that but if we drew, it is still fine. He only spoke about us because someone asked him, he is not interested in how good we are. I'm not interested in how good Man City are, I know it so I work now on us so we can make them look not as good. We did have to find a position for (Shaqiri). That's a pretty good one, we tried it in a 4-3-3, he can't play there yet as a half-space midfielder. You don't want to force a player into a position, you want to show his strengths, not where he isn't good. Xherdan's main quality is obviously offensive - creating, shooting, finishes, being between the lines - and in a half-space position, there is a lot of defensive work. He can do that and he gets better day by day and maybe one day, he could play it like Phil could play it in the last half year he was here. We cannot do that constantly [spending big on players] and we will not do that constantly. The good thing was that, like most things in life, the timing was important. We had the money and the players were on the market. We didn't know exactly when Alisson was on the market and when it was clear that he was, we had to, even if we had to collect money somewhere. With the Neymar transfer, the whole world changed. Could I have expected someone would have made the move from Barcelona to PSG for that money? No. But then, we had a bit of that money because of Phil [Coutinho] so what do we do? We don't build houses, we invest in this club and invest in players. The money was there so let's use it in the smartest way and that's what we did. Since I've been here, we've always sold players and bought players because that's how it is. I don't know what our net spend is at the end, but we bought fantastic players in. Like Gini Wijnaldum, what a player he is. We bought him from Newcastle, playing left-wing or whatever so that's really nice. So really good signings and two for really big money. You don't start a book every day on page one, so most of the players have worked together for a while. Virgil had to adapt because Southampton advance differently to us but he did it very well because of his class. For him, it was much more about pushing up, because sometimes we defend on the half-way line when he didn't do that too much at Southampton. Is this the title decider? As for the others, [Andy] Robertson has been here a year-and-a-half, Trent [Alexander-Arnold] is here since I've been here more or less and a lot of the others have been in for a long time. You build on what you know already and then you work on the details, that's how it is. Confidence is a wonderful thing. You look behind you and see Alisson going 'come on, let's push up' because he plays that much in the field. Will he make another mistake in the future? Yes, 100 per cent, but for me, it is all the benefits we get from his offensive play. With the ball, without the ball, the way he is really involved in it, that is really massive, and the boys feel the same. We have the quality.